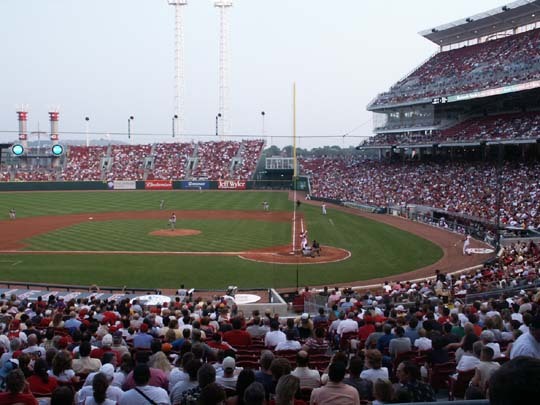 The Cincinnati Reds play at Great American Ball Park which is located on the riverfront of the Ohio River. 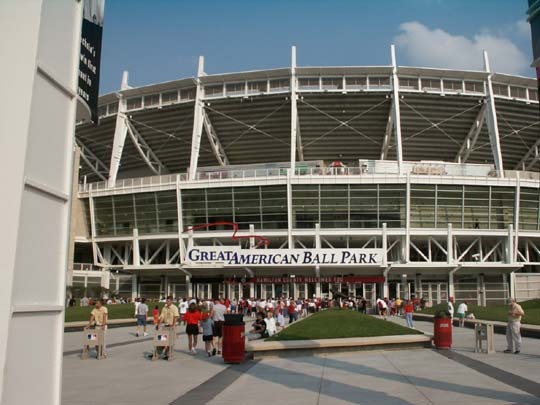 Great American Ball Park opened in 2003 directly east of the location of Riverfront Stadium and then Cinergy Field. 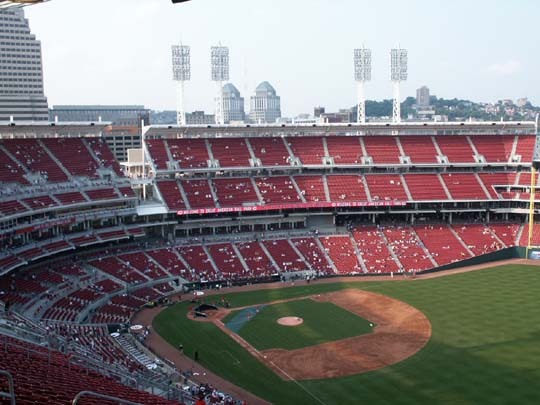 It seats 42,271. 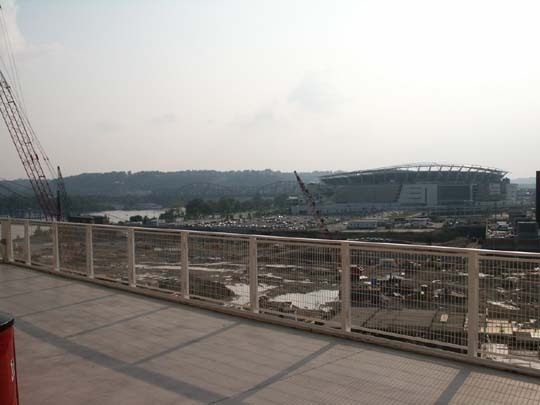 The old stadium has been destroyed and a new street and parking garage is being built in its place. The new stadium is very nice with a lot of artwork. The main entrance opens off of Crosley Terrace. 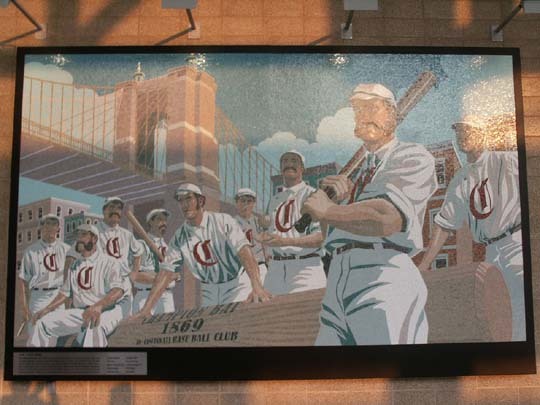 This area will have statues depicting the last team that played at Crosley Field, the predecessor of Riverfront Stadium. 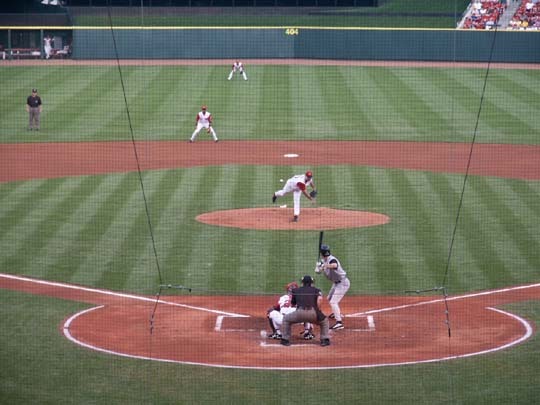 You can see the pitcher if you look close in the entrance photo. 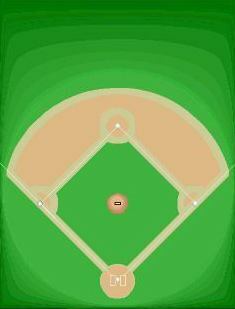 They have only the pitcher and the on-deck batter at this time. 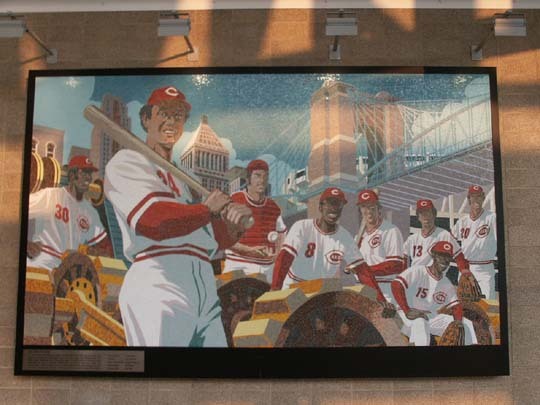 Inside the main entrance are two mosaic tile murals, one showing the first Cincinnati team and the other the members of the Big Red Machine of the 70s. 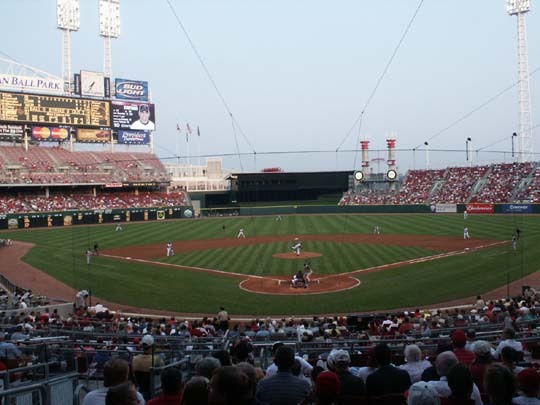 The Reds were playing the Arizona Diamondbacks with Curt Schilling pitching against them. 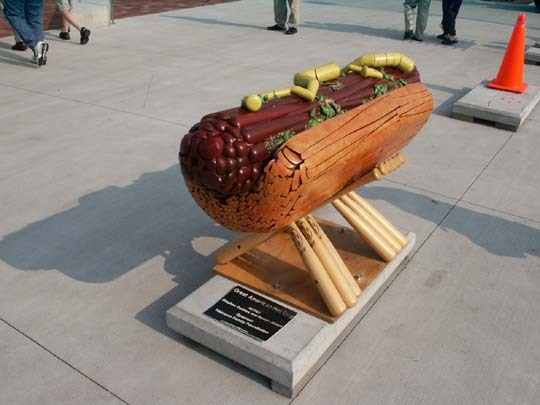 The D'Backs won the game 2-0. 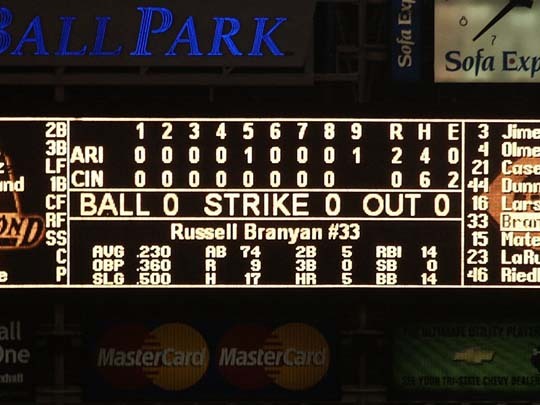 The box score was D'Backs R-2, H-4, E-0 and Reds R-0, H-6, E-2. A well pitched game on both sides. The field lines are RF-325', RC-370', CF-404', LC-379', and LF-328'. 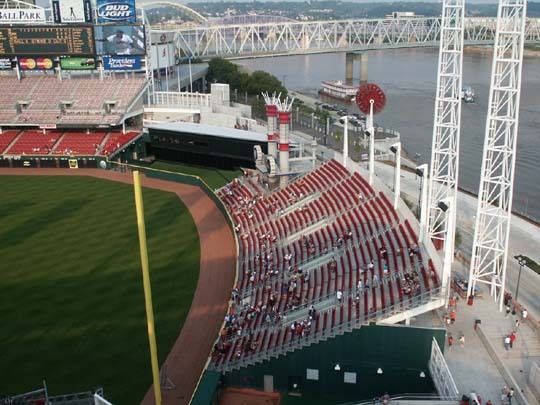 The seats are all red and the seats in the outer 3rd level are turned in towards homeplate. 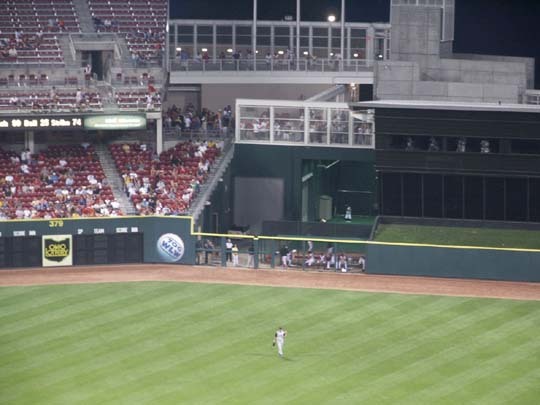 Left field has bleachers with backs. 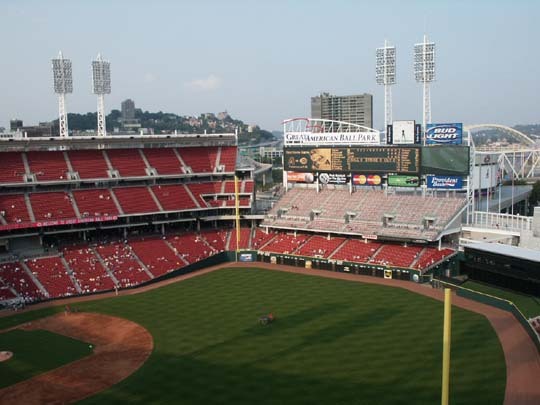 There is a separate building for the seating on the third base side. 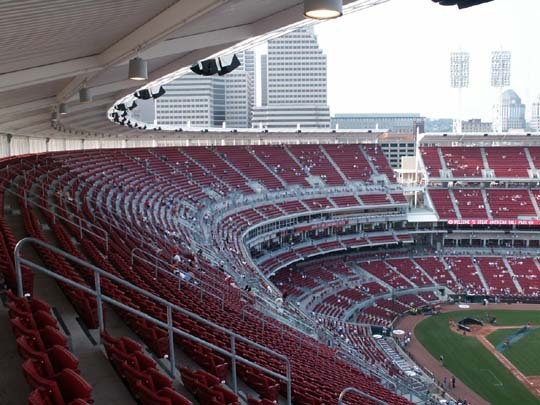 It has a larger section below the aisle than does the building from behind home down the first base side. 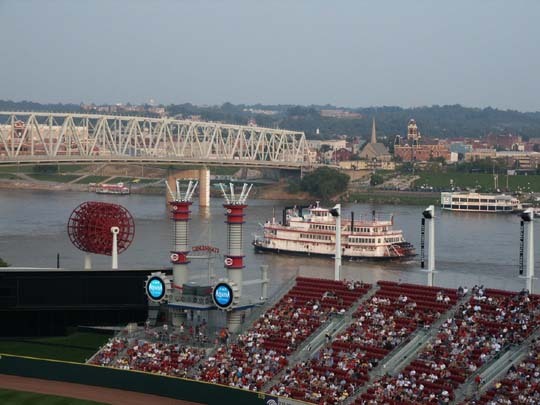 In right center field are riverboat smokestacks and a riverboat paddle wheel. 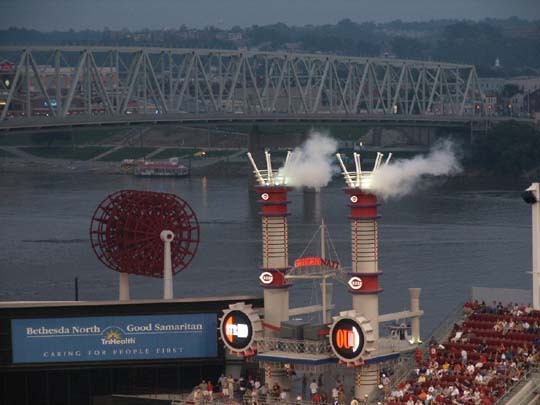 The smoke stacks puff smoke and light up when the Reds do something good. 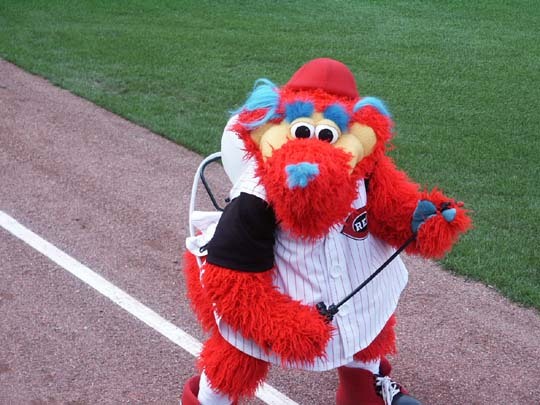 The mascots are Mr. Red, with a baseball head-the longtime mascot, and Gapper, who was added this year. 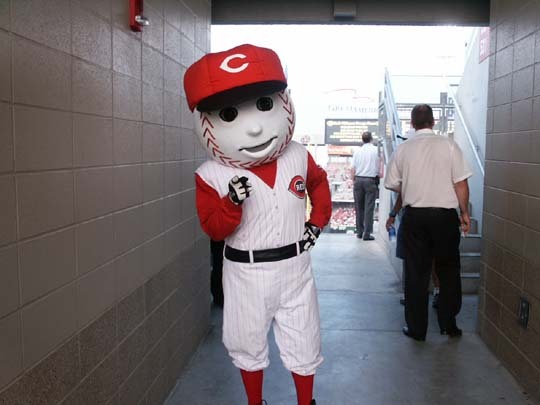 Attendance tonight was 31,485. There were limited concessions open on the upper level which caused long lines. There was a good selection of different foods available on the main level at the different stands. 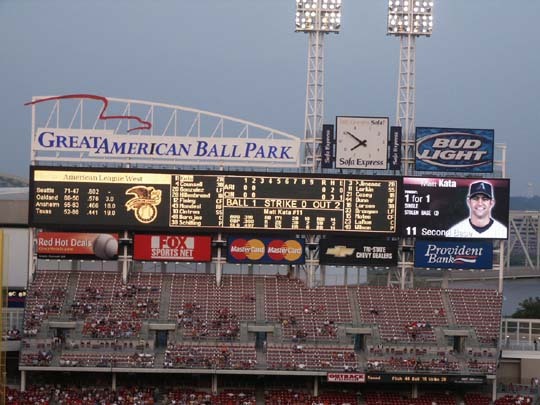 The scoreboard information about the batter is very complete. 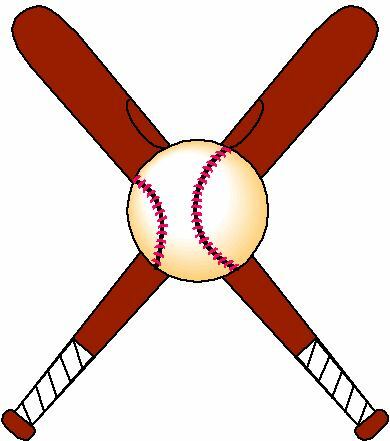 There is a benefit auction going to be held to sell artworks made from baseball bats later this year. 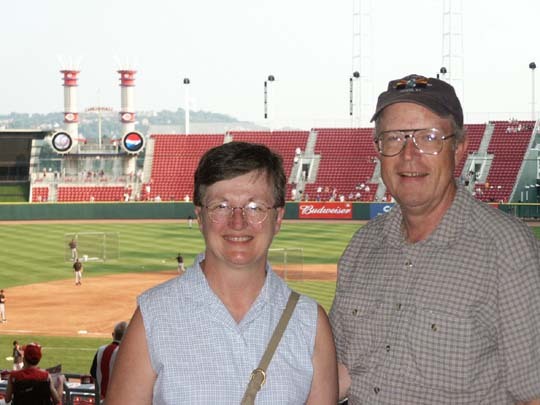 Two items at the ballpark were a Great American Hot Dog and The Big Red Machine. 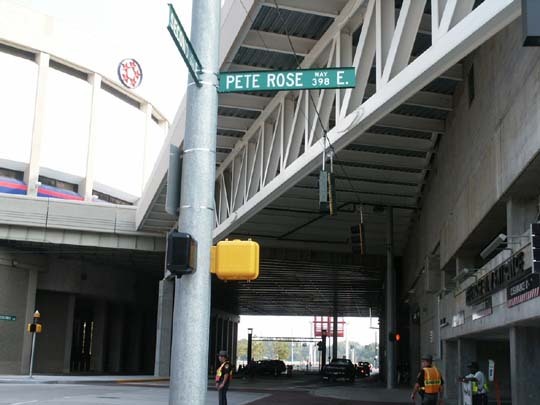 The street in front of the stadium is named Pete Rose Way. 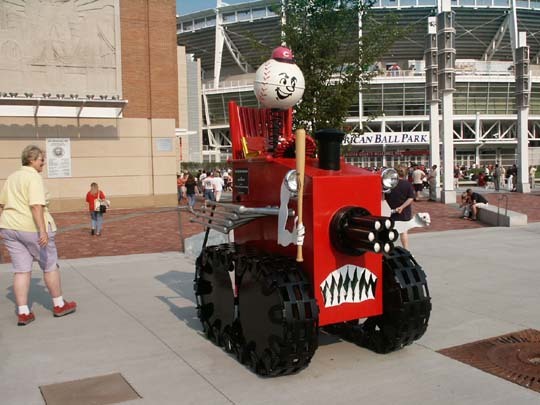 The construction site is where the old stadium was located. 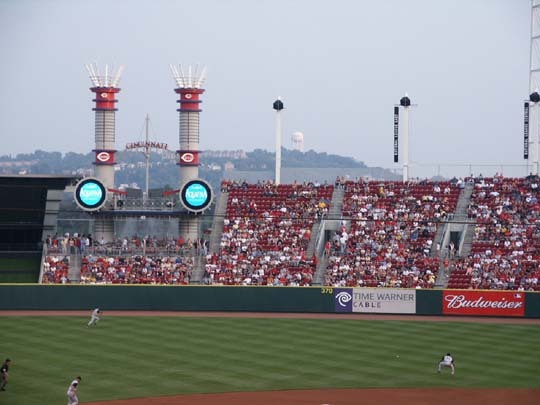 There are banners around the stadium that celebrate important dates in Reds history. The National Underground Railroad Freedom Center houses a collection that tells about slavery in America, highlighting the role of the Underground Railroad. You see an actual 1830 two-story log slave pen, with wrought-iron shackles intact, which was moved from Kentucky.